NOW Recovery Factors is a bioactive whey protein derived from bovine colostrum that has been microfiltered to achive a higher protein content. 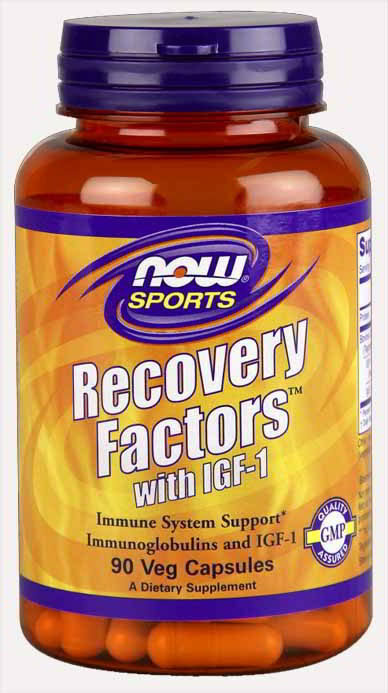 The resultant concentrate includes lysozyme, immunoglobulins, lactoferrin, IGF-1, and other components that are known to support the healthy repair and growth functions of the immune and gastrointestinal systems. This can be especially important for athletes, because intense exercise can temporarily stress the immune system and GI barrier integrity. Suggested Use: Take 1-2 capsules twice daily. Other Ingredients:Cellulose (capsule), Magnesium Stearate (vegetable source) and Silica.